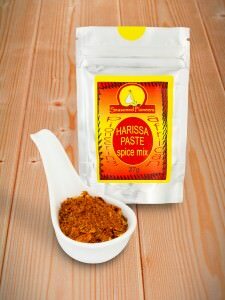 Mix the Harissa spice mix with the olive oil. Dice the lamb rump and coat with the Harissa marinade. 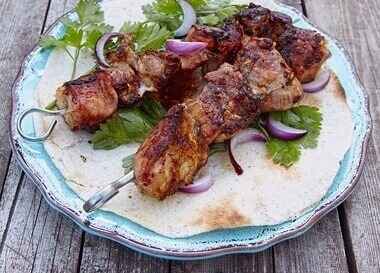 Place the meat onto skewers and grill until the lamb is cooked but still pink, approximately 7 minutes. In a separate hot pan, fry off the aubergine with some oil, then add the cooked chickpeas and fry for another minute or so until everything is warm. To make the cucumber dip, mix the yoghurt with the grated lemon zest, the chopped mint and the diced cucumber, adding salt & pepper to taste. Arrange the warm chickpeas and aubergine on a plate, place the lamb kebabs on top and serve with the cucumber dip on the side.